Prizma - this isn't just glass! Purity and hygiene at its best! PRIZMA Glass Splashbacks is a great alternative to tiling in a kitchen. Panel assembling takes only a few minutes and does not cause a mess in your home. The product is hypoallergenic and doesnt have grouting, which is what can cause fat, and harmful bacteria to accumulate. Select from hundreds of quality graphics and protect will your wall against dirt right now! Bespoke glass with any graphic. Thanks to the smooth, non-porous surface, you can use your glass splashback as a dry erase board, for example, to make a shopping list (markers not included)! The surface guarantees a quick and easy clean without worrying about it and the intensity of colours. All you will need is a glass cleaner and a paper towel. Easy, clean and simple assembly will not change your home into a horrible mess! You need only 15 minutes to make all assembly works (this period doesnt include time for adhesive drying). A wide selection of graphics ensures that everyone will be able to choose something that is right for them. And if you are looking for a tailor-made splashback for yourself or as an idea for a gift - write to us, together we will do something special :! In contrast to the competition, our prints are not glued to the glass but instead are welded to it. This form of application guarantees many years of durability and image resistance to unfavorable conditions. You can now decorate your kitchen without any concerns! The laminated, 4 mm thick hardened glass and polished edges ensure high safety and durability. We care about our planet! 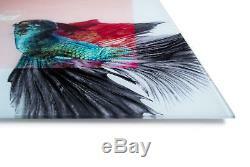 For printing we use only eco-solvent inks. This makes our prints not only beautiful, but also environmentally friendly! Laminated, 4mm tempered float glass. PRIZMA Glass Splashbacks is printed in eco-solvent technology on a high-quality PVB film, and then welded and laminated with a high temperature resistant 4 mm tempered float glass with ground edges. Our modern and advanced technology guarantees high details and amazing colour depth of printed products. 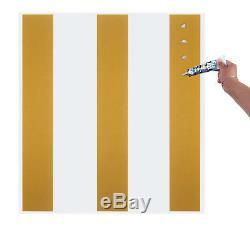 For installation, you should use acid and solvent-free mirror adhesive. We recommend Soudal Fix All Classic glue. A small amount of glue applied directly on a top layer of the protective tape. Don't remove the yellow/green strip! The adhesive should not get in contact with a graphic. The amount of glue should be enough to cover the tape but not exceed the layer after pressing it to the wall. The surface under the splashback should be flat, dry and dust free. Please feel free to ask if anything relating to installation is unclear. Remember that your panels should not have direct contact with fire. We strongly advise a minimum 5 cm of space between the panel and the flame. Making your loved ones happy with an original gift..
PRIZMA Glass is a great gift idea for you and your close ones. Send us the picture you want to print. Our graphic designer will perform basic processing of the image like the colour tones or contrast adjustment and will then prepare it for printing absolutely free. We can also create premium graphics projects at highly competitive prices. As you can see from the example on the left. Create a modern interior by using glass panels! We know how different the needs of our clients are and we want to completely satisfy them. Maybe, is your idea unique, or do you need assistance in creating your design, if your ideas are unclear, then our designers can help they always love a challenge! We will do everything we can so that your interior looks just the way you imagine it! You can select from a range of 45 colours. Take advantage of our designer's support. We use only laminated tempered glass in our production process. For yours and your loved ones' safety. We only provide proven solutions for our customers and their homes. Take a look what else we have prepared for you. What will you need to install your glass splashback? Acid and solvent free glue for glass. Around 15 minutes of your time. Check how your order will be processed. Short story about big steps. The PRIZMA brand is a family run company that was founded in 2016. The primary reason for the business idea was to help respond to the demand related to current trends in interior decorating. During this time, we had the pleasure of fulfilling the orders of several thousand satisfied customers who were continuously setting new goals for us, which helped us to achieve and provide the perfect service. Thanks to the high demand at the beginning of our business venture, we were able to gain, and a good understanding of customers needs and we can now find a solution to more challenges every day. Do you want to know more? Unauthorized use of our texts, images or elements of design is a violation of applicable laws and will be reported to the appropriate services. Icons made by Eucalyp from Flaticon. 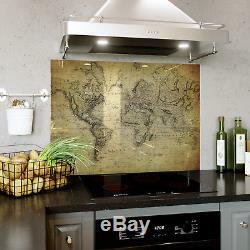 The item "Kitchen Tempered Glass Splashback Wall Panel 47 Sizes Retro Vintage World Map 03" is in sale since Wednesday, August 1, 2018. This item is in the category "Home, Furniture & DIY\Cookware, Dining & Bar\Other Cookware, Dining & Bar". The seller is "prizmauk" and is located in High Wycombe. This item can be shipped worldwide.